This timepiece is at home all over the world: thanks to its sophisticated time zone mechanism, since its premiere in 2015 the watch has provided genuinely borderless precision. 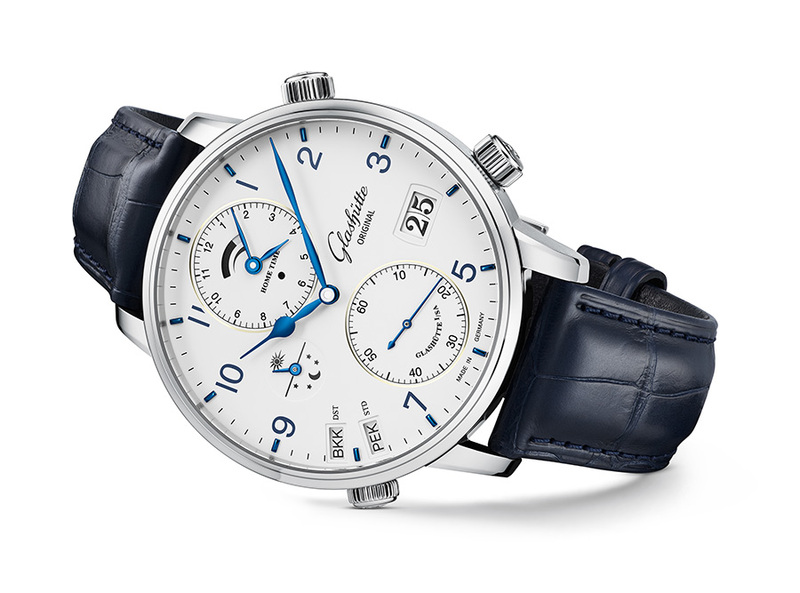 In 2018 Glashütte Original presents the sequel to this success story; the new Senator Cosmopolite debuts in stainless steel and with a minimalistic design. It is the ideal companion for all who travel frequently or maintain international contacts – and of course for all friends of the renowned German art of watchmaking. The origin of this mechanical masterpiece is unmistakable: the latest interpretation of the “Cosmopolitan” is executed in the characteristically clear style of Glashütte Original, and is presented here with a particularly contemporary look and feel. Dark blue and white form the predominant impression, with black detail providing visual accents. The clear design also makes reading the individual displays a pleasure. The 44-mm stainless steel case features both satin-brushed and brilliantly polished surfaces. 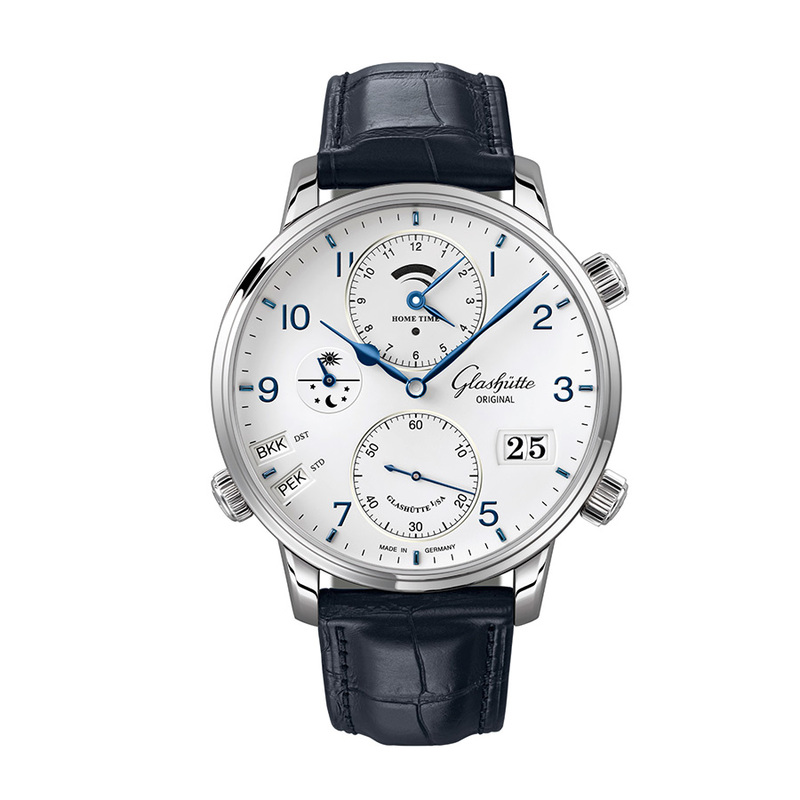 Dark blue printed Arabic minute numerals and blue appliques are set off against the matte white lacquered dial. 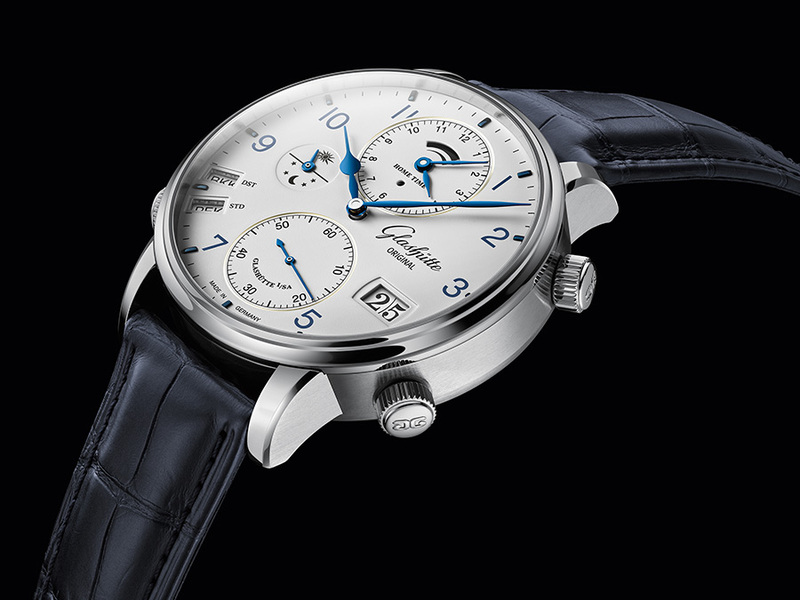 A small second at 6 o'clock and the Panorama Date at 4 o'clock complement blued central minute and hour hands. The separate home time display at 12 o'clock is combined with an exceptionally helpful day/night indicator and a power reserve indicator. The two auxiliary dials are circumscribed by a slim, brilliant silver ring. At 8 o'clock two narrow display windows fit snugly into the curve of the dial and present the destination as an IATA international airport code in one of three colours, and separate displays for Daylight Saving and Standard Time. Positioned at 9 o'clock is the newly designed day/night indicator with a small sun and stylised night sky. The elegant appearance of this timepiece is enhanced and completed by a dark blue Louisiana alligator leather strap with pin buckle or fold-over clasp. The displays of the Senator Cosmopolite have been designed for easy legibility, but the mechanism behind them is complex. 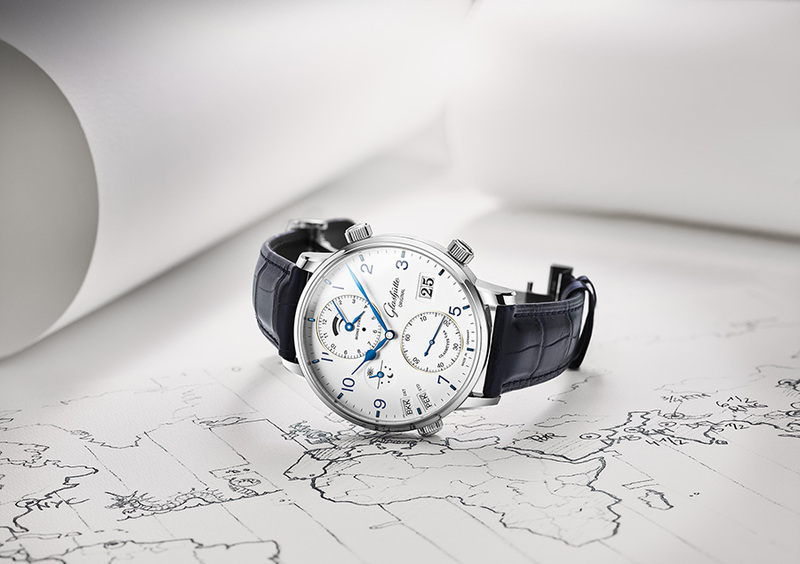 In developing it, the Glashütte engineers have enriched the product line with a complication as ambitious as it is contemporary – while placing particular emphasis on ease of use. With the Senator Cosmopolite one can set the time in two time zones at once, without the wearer having to think twice about it. A time zone ring offers a selection of the 36 world time zones currently in use. Each of them is displayed using an official IATA location code representing an international airport in the relevant time zone. Not all time zones are offset from the Greenwich Mean Time reference time in intervals of one hour: for this reason, the 24 time zones that do show a full-hour deviation are indicated using a black IATA code; a further nine time zones with half-hour offsets are shown in blue, and the remaining three IATA codes appear in red. The two windows at 8 o'clock allow the wearer to set summer and standard time (Daylight Saving Time – DST / Standard Time – STD); an easily read Day/Night indicator for both home and destination offers additional orientation. Any necessary adjustments of the date while traveling forwards or back in time are handled by the movement's intricate mechanics. Setting the displays could not be simpler: the home time can be set using a crown at 2 o'clock, and the current time zone is selected using the crown at 8 o'clock. When traveling east (forward in time), one turns the crown at 4 o'clock clockwise until the IATA code for the destination time zone appears in the corresponding DST or STD window. When traveling west (back in time) one turns the crown counter-clockwise. In both cases the central hour and minute hands shift forwards or back in 15-minute steps, so that the IATA code for the destination time zone can be seen in the DST or STD window. At this point the traveller needs to make no further changes: the central hour and minute hands indicate the correct time at the destination, enhanced by the correct day/night indication at 9 o'clock – and by the correct date at the destination. If, when setting the destination time, one advances past midnight, the Panorama Date shows the corresponding change of date, backwards or forwards as the case may be. The intelligent mechanics are hidden within the 4 Hertz manufactory Calibre 89-02, provided with energy by an off-centre rotor. Its power reserve is a minimum of 72 hours. The regulator-free regulating system with swan-neck spring can be adjusted using the four tiny screws on the balance wheel, which ensures a high degree of rate precision. The finely finished surfaces and numerous details of the automatic movement with its typical Glashütte three-quarter plate can be observed through the anti-reflective sapphire crystal case back.